Remember when cars didn’t have starters, and you used to have to crank them to start? Okay, neither do I. But I’ll bet a lot of you remember a time before cars were mostly computers. On my first car, the starter was about the only thing electric, let alone electronic. On my current car, you quite literally can’t operate it without the help of a little brain. No, not that little brain. 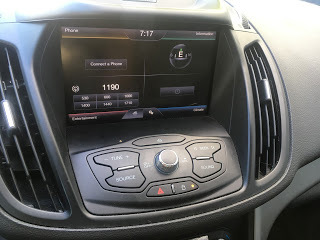 If all the computer stuff in my car stopped working I’d not only be out my radio (excuse me, entertainment system), but I’d have no way of knowing my speed or how much fuel I had. I mean, I could get a dipstick, but don’t we have enough dispsticks on the roads? My car’s abilities are awesome, but also scary to a science fiction fan like me. 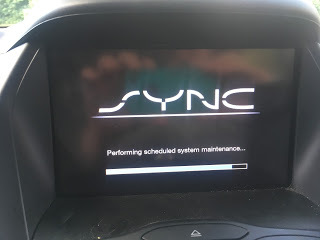 Yeah, my car was installing updates. I kept waiting for it to restart all by itself. And how do I know what new program was loading? Cylon? Terminator? Didn’t Stephen King write a whole story about this? Someday I may not be able to escape from my Escape. It’s the carpocalypse. I suppose the survivors will have to go back to the crank start. It would have been a whole lot worse if it said “NSYNC”. It’s only funny because the car let me out! It let me out that time … but from then on whenever I drove anywhere I brought along some food and water, just in case.